Once again this season the Respect & Protect campaign will feature a fun contest and the potential to win some exciting prizes for those that participate. Respect & Protect is a promotional campaign targeting our youngest players created to encourage safe and respectful hockey and reduce injuries, especially brain injuries. 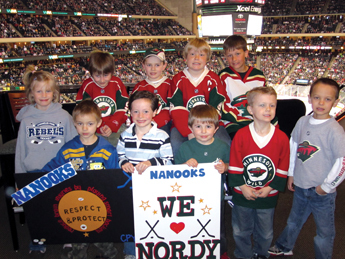 Respect & Protect is a partnership between the Minnesota Wild and Minnesota Hockey delivering the message that by respecting coaches, officials, teammates, opponents and fans, the great game of hockey is better for everyone. In addition, staying safe is equally important. It is critical that we protect ourselves and our opponents from injury and be consciously aware of where we are and where our opponents are on the ice. 2. Minnesota Wild “Secret Scouts” will randomly show up at ice rinks across the state during the 2011-2012 season. The “Secret Scout” will find select players who have the Respect & Protect sticker on their helmet. 3. The Grand Prize winners enjoy a Minnesota Wild home game in a luxury suite at Xcel Energy Center in St. Paul (date TBD by the Wild). If you need extra stickers for other young hockey players in your home, please send an email including your name and mailing address to info@minnesotahockey.org. Last season players were asked to affix the Respect & Protect stickers to their helmets. Those spotted by the Secret Scout are pictured here, enjoying a free night in a suite at a Wild game! ©2019 Minnesota Hockey Journal / SportsEngine. All Rights Reserved.